Syracuse’s (17-9, 8-5 Atlantic Coast) senior big man stuffed the stat sheet, pouring in 29 points to go along with eight rebounds, four blocks and two steals, as the Orange got its first victory over a ranked opponent this season, defeating the Cardinals 69-59. Down 47-44 with just under 10 minutes remaining, Kaleb Joseph hit a jumper from the top of the key that ignited a 16-5 run for the Orange which sent the Carrier Dome crowd into pandemonium. Michael Gbinije continued his hot streak, finishing with 18 points, six assists, five rebounds and a remarkable block on a breakaway dunk attempt by the Cardinals’ Terry Rozier midway through the first half. 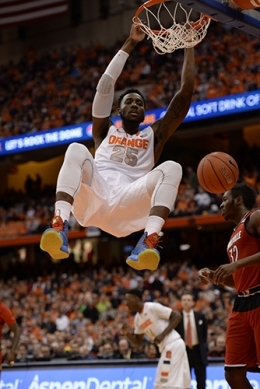 The Orange junior is averaging 20.5 points, 4.6 rebounds, 4.8 assists, and 2.5 steals over his last six games.